Crystal Pier, Pacific Beach, California. Early 1970s. Photo: Brian Tissot. In the long arc of my surfing life my early years remain indelibly etched on my psyche, as is true of most surfers. Why is simple: we are pulled in by the ocean’s allure, rapidly learn her inner-most secrets, measure our courage against her power, but are ultimately humbled by fear. It is the beginning of a life-long love affair: a relationship where you always chase but never catch. Because the ocean, for all her glory, beauty, and power is indifferent and no matter how much time you spend trying to understand her moods there is always more to know. Of course, this is both the allure and the challenge of surfing, or of any such life focused on the sea. And at an early age, I just learned to surrender to my passion for the ocean and let it lead me through life. It has served me well. But I have never forgotten those early days, my first dates with the waves. And so it was for me when I began chasing waves in 1966 at Crystal Pier in Pacific Beach near San Diego. At nine, according to my mother’s rule system, I was too young to surf with a board because I might get hit by it and drown. Wait until you’re 13 she said. So while I watched my older brother ply the waves my first experience was on a “foamie”, a 3-foot white foam board designed to float in tranquil pools. Instead, I dragged it out into the raging summer torrents of white water off Crystal Pier in a pitiful attempt to replicate what skilled surfers were doing offshore. I was rewarded for my efforts by a severe pounding in the low-tide shore-break which after a few righteous waves snapped my foamie in two and sent me scrambling back to the beach. Such was the power of the ocean to a grommet or grom, a young surfer. But yet I never forgot the few milliseconds of joy I experienced while being plummeted by the sea. So four years later, after moving from San Diego to Virginia to Idaho, I was back in Pacific Beach, turning 13 and finishing 7th grade. My mother could not stop me now and I saved up the cash for a board from my morning paper route for the San Diego Union. With that, I bought a 9’6″ Hansen Mike Doyle pintail, which was the love of my life that summer. So when school let out during in June of 1970 I threw myself into a summer of surfing with my best friend Neal Unger. It was an amazing time: free, pure, and the kind of transformative experience that can change your life. Of course, I didn’t know that at the time but can say that confidently now looking back from the relative sanity of advanced adulthood. My first board in spring 1970. Now in 1970 in Pacific Beach surfing was in full swing and had been for many years. Long boards had given way a few years earlier to short boards. We rode down to the beach which was 15 blocks from my house, either carrying our boards on our bikes, walking, or the occasional ride from our parents. And would spend the entire day there; or at last until the waves were blown out at noon. We soon discovered that every beach street had its own crew, each with its own rules, surf stars, pecking order, etc. as we soon learned. Although we started at Law St., where most of the experienced surfer hung out — including Skip Frye, the local legend — we soon learned it was a bit too advanced for us and moved down to Diamond St. or the no-mans land in-between but eventually Crystal Pier. Starting out we were clueless so we just pushed our boards out into the surf, fin first, and jumped on to surf the white water all the way to the beach. After a few hundred times we gravitated to riding swells like real surfers. I still remember that first time we padded outside at Law St. and sat in the line-up. We were all smiles, proud of ourselves for the big accomplishment. Hey we were surfers! But then everyone dropped to their boards and quickly began paddling offshore. And so did we — although we didn’t know why — but we were a bit too slow and got caught inside and thoroughly thrashed by a large set of waves. So we learned, and watched, and repeated everything we saw. And soon, after another couple of hundred rides, were riding swells like everyone. And that’s the way of it. That is the surfer’s life. Honestly it was wonderful. When else in your life have you ever spent so much time and attention focused on one thing. And that one things was riding waves. We’d surf twice a day, every day, for months and eventually years on end. Our goal was simple: to learn how waves break under every imaginable combination of swell size and direction, wind strength and direction; varying tidal conditions — low tide, high tide, spring tide, neap tides — than add the condition of the shifting sand bars, the wax and wane of the crowds, the lineup, the slope of the beach, etc. And with all that you develop, purely instinctually of course, is a sense of how a surf spot works. One look and you know where to go, how to select waves, and what it what it would feel like surfing, Such is the life of a surfer. And of course then you move to another spot and have to start all over again. This is why the life-long love affair starts and never ends. 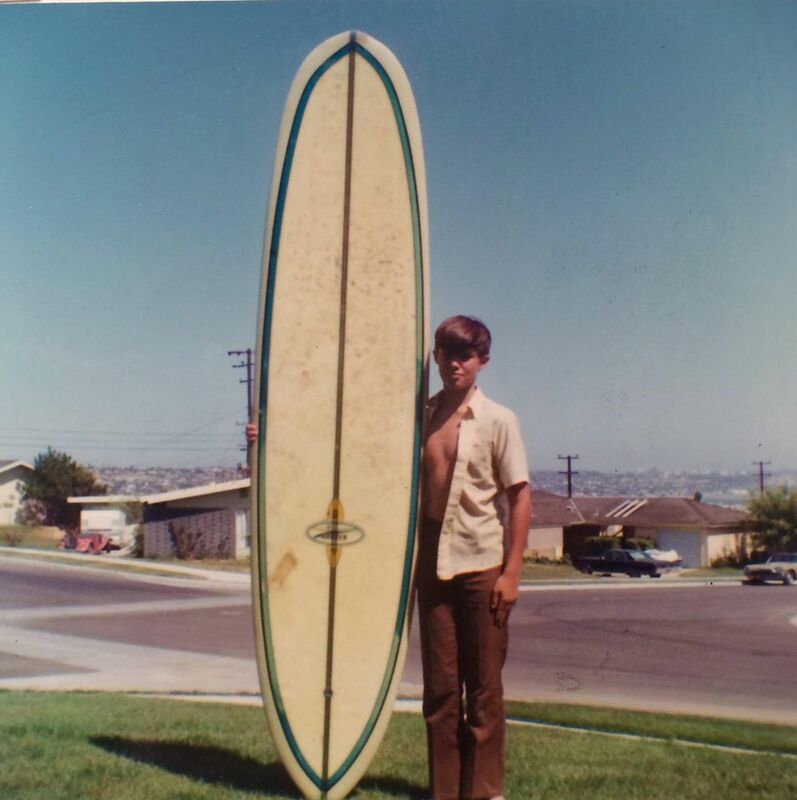 Me with my 7’8″ Sunset, Fall 1970. Photo: Gene Tissot. And then the big day came: school started, 8th grade, and the weather got colder. Even in San Diego that meant buying a wet suit or hanging up surfing until the summer. I had the money from my paper route so a wetsuit it was and a new board as well. 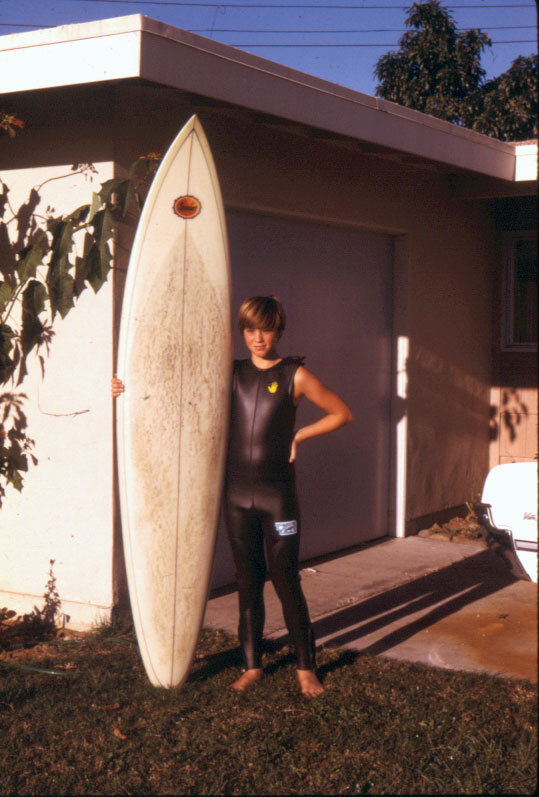 So in the fall of 1970 I embarked on a new season of surfing on my 7’8″ Sunset gun and a Body Glove wetsuit. I loved that board but it was way too big for PB and I was still too much of a grom to control it. But it looked wickedly cool. I remember when the day came that I finally shot the pier. I caught a right and instead of turning away from the pier something told me to go for it, so I did, threading the pilings with ease as the wave exploded around me. Tragically my board snapped in two against a piling several days later so my joy was short-lived. But I quickly recovered when I jumped on to my next board which was a 5′ 10″ twin fin, the most common board at the time. 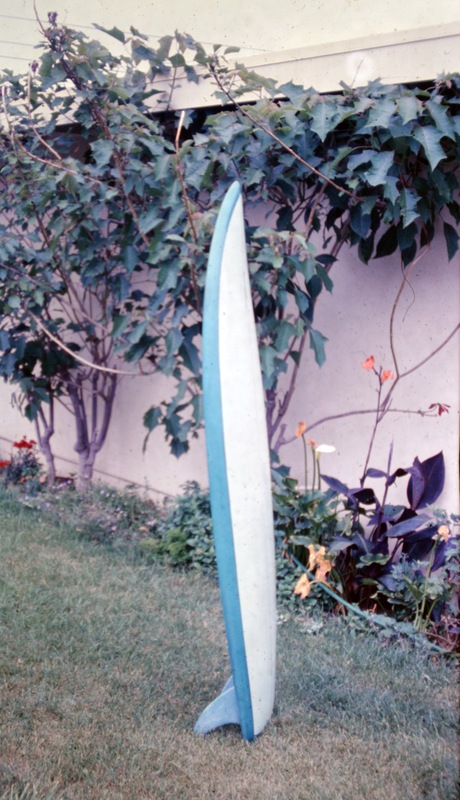 My 5″ 10″ twin fin, late 1970. A fun board but it tracked and hummed. Photo: Brian Tissot. I loved the twin fin as it was maneuverable and helped me join the short board revolution and advance my skills to the next level. But it was a difficult to board ride. No long drawn out lines with this one or a fin would track and you’d fly off the board. Instead you had to whip it around and keep it moving. The board also had this weird configuration whereby the fins would hum if it moved with at any appreciable speed. Regardless, I was stuck with it and rode it for the rest of 1970 and all of 1971. And later, in 1972, I was forced to move to the Bay Area where cold water and rocky cliffs greeting me, and rather abruptly my grom days were over, although my surfing life was just beginning. And even though I continue to surf 45 years later, I look back on those early days with fondness.They are still in my dreams and thoughts and they sustain me in my life. Because I can always look back with satisfaction on those days and say “I got it good.” For I still remember, like flashes of a camera in a jerky film, pushing out through the surf with Neal, taking off on my first swell in the lineup, my first great bottom turn and tube ride; all those intimate moments and times of terror that I experienced those first two years. But most of all I remember the waves of Pacific Beach and Crystal Pier in all their uniqueness, power and fickleness. My first love affair with the ocean. You know, we probably surfed together in 1970 and/or ’71 at Law St. without knowing it, I don’t remember if we ever talked about this, crazy. The last place I lived before moving up to Pismo in the summer of ’71, was on Reed St. in PB. I had a place of my own, a tiny cottage behind a house, and would go surfing everyday after work, almost always at Law St., I rode a 7′ 2″ Canyon. I loved that board, and took it with me when I moved up to Pismo, then Jerry Grantham, who became my first new friend, came up to me after surfing, and said, “you can’t ride that here”. “I can shape you a board that will be perfect for you, for these waves.” The waves didn’t really look or behave all that much different than what I was used to in San Diego, but I decided to play along. And so began what was to become a long friendship. You know the rest of the story. You can get lots of waves if you’re one of the friends of the big kahuna.